$50 deposit is required at least three days prior to the event. Deposits are applied to total cost. Deposits are NOT refundable in the event of a party cancellation or for any other reason. You CAN reschedule for a different date. If a group size falls below the initial group reservation, the price will convert to the next lower group size price range. In other words, if you made a Rock Party reservation for 5 at the listed rate of $37 and only four show up to the event, the rate will go up to the 4 Painter rate of $40 each. The minimum party price is Four (4) paying participants. Serving the Ely Area – 55731 zip code 10 mile radius. Call for mileage/travel rates beyond 10 miles from Ely. So, wanna do something really fun and creative in your home this week or month? 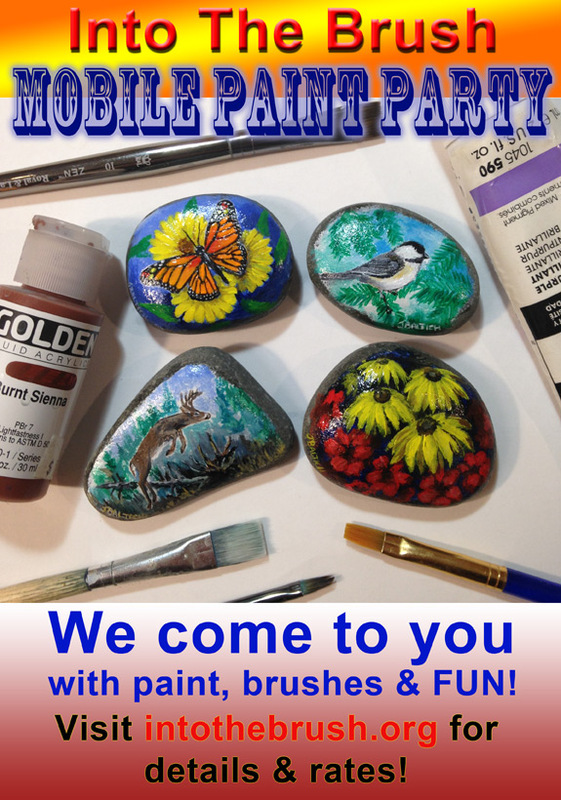 Give us a call and schedule a Mobile Paint Party by Into The Brush. Guaranteed to be a great time! WARNING: Painting fine art can be addictive, plus therapeutic, relaxing, and immensely satisfying. Don’t blame us if you find yourself wanting recommendations on what to buy and how to get started in painting on your own! And this beats the absolute HECK out of adult coloring books!!!! What’s Out On The Fernberg Road? For 1 minute, 30 seconds of your time, you’ll see! Have a great Minnesota Family Vacation at this resort near Ely, MN! Take a few seconds to see where you could be next summer! Come Stay, Come See – Pack it all in? I have to laugh a little. The world, under digital “assault” and influence has become a bit silly in how it seeks recreation these days. I’m referencing the “need everything/do everything that-can-be-fit-into-a-day” crowd who kindly call to find out more about making a reservation to stay here at Northwind Lodge. Now, don’t get me wrong, I’m not complaining about anything but I am marveling at what appears to me to be either a really high set of vacation expectations or a complete lack of common sense or a little of both. The interesting part is the initial phase of making the reservation. Now everything is laid out in the website as to available activities here. Nonetheless, I think they just need to hear a human say the activities roster on the phone. As a result, they want to know what species of fish are in Jasper Lake (Large/smallmouth bass, sunfish, northerns, perch and some walleyes) plus they want to know what they are biting on (three weeks into the future – OK, we’ll guess), and if they will be catching fish (another guess – Most Certainly, Sir! – 6 to 10 hours). Then, many need to know what the hiking options are (Blackstone/Secret Trail – 3 hours, Kawishiwi Falls Trail 1 -hour, Bass Lake Trail 3-hours) and how difficult/easy they are. Then, they want to know what there is to do in Ely (Wolf Center – 3 hours, Bear Center- 3 hours, shopping in Ely – 3 hours). Then they need to know what dining options there are in town (Italian – Sir G’s, Nouveau – Insula, Chocolate Moose, American-Evergreen Restaurant, Rockwood, Steak House Gators Cheese Emporium, Fast – Dairy Queen, Subway, and a few others I’m forgetting here. Each restaurant will burn up about 2-3 hours of time. After that, they need to know if they can fit in a Boundary Waters Day Canoe trip to an area that will have few people (Sure, how fast can you paddle?). That’s another 6 hours minimum. Many times, they will need us to rattle off all the entry points (Moose Lake, Snowbank Lake, Lake One, Ojibway Lake, Fall Lake, Wood Lake) that surround us for their consideration before deciding to pull the trigger on a two-night stay here at the lodge. OK, at this point, knowing that it is two whole nights and about the equivalent of two daylight days, you may want to do the math and add up some of the hours. Usually after that barrage of questions in making time-management decisions, we see people checking in, going to town to have dinner, and oversleeping the following morning by about 2 hours. At about 11 AM, they are up and around saying they “usually don’t oversleep like this at home”. Then, some head down to the lake and sit in the Adirondack chairs and look out across the water. Others head out in a kayak and enjoy the day. Then, they come in for a sandwich and later, check out our store and then take a nap. Then, maybe a hike on the gravel road to Ojibway Lake and it’s time to grill a steak and have a beer or glass of wine. Then a nap before bedtime. Maybe sit by a fire at the beach. After that, they wake up the next morning and have to check out at 9 AM. I grew up right here and for 48 years have observed this going on for all these years. In my opinion, two nights at a region like this is great, but doesn’t quite hit the mark for the vast majority of vacationers. In pre-trip decision making, one needs to realize that in fresh air surrounded by the incredibly beautiful area called “Ely” and particularly at Northwind Lodge, the activity list usually gets chucked and time speeds up, even in a week long stay. So, in making plans to run all over the state in a week-long whirlwind tour, give that some thought. It’s not Wally World and Youtube and in reality, you most likely won’t be getting a heck of a lot done in just two nights. Stay a bit longer, plan on wasting a few of your days snoring. Then go paddle and hike and fish and shop and explore. Just met a soft-spoken, unemployed civil engineer who, five years ago, decided that sitting around worrying about his lack of employment due to the “Depression’ was not getting him anywhere so he started to walk across the country. He’s walked the eastern seaboard from Key West to Canada, some Pacific trail and several others. He was now walking from Missouri (his home and where his wife is located) to New York following trails and connecting roads. He had one midsized pack on his back and a couple of hiking poles with some serious miles on them. I wanted to find out if he was a little nuts because he looked a little light in gear for the Kekekabic trail which is a four-day adventure in rugged terrain. I had recently spoken with a deputy sheriff from Lake County who had to go in a few weeks ago to rescue two guys who only brought with them a battery operated GPS (and no map or compass!!!) which they lost by dropping it when crossing a fast-running creek. It was fresh in my mind what can befall someone on the Kek trail when they get lost or the weather goes south quickly. I didn’t want to see another guy get himself in trouble, hence the reason for my questioning his preparedness and mental state. I figured I could always call the sheriff’s department once he was out the door and they could catch him. After a bit of conversational questioning and general Iron Range nosiness, I found out that he refers to the current recession as the Depression and doesn’t believe it is actually merely a recession. I also saw that he had the correct maps and a smartphone. He claimed he had a satellite emergency notification system (like a Spot), a GPS and plenty of food tucked in that pack. He sounded sensible, not overly certain, and quite capable. It was after all that when I found out he was a civil engineer by trade. I mentioned that “my walk across the country” was in that canoe resting upright on sawhorses before him. I explained that with the depression and increased competition for even less discretionary dollars, retail business slowed down in our store so dramatically that starting last June I fell back to my one ability that nobody can take from me. That would be my ability to paint. 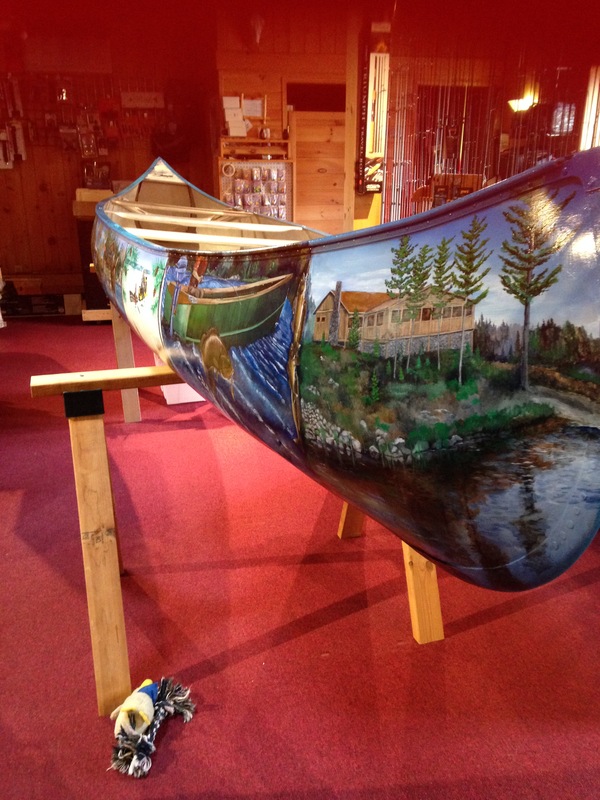 I pointed to my painted canoe and told him that the silver lining in terrible business is that I was afforded the time and opportunity to do something really different and The Painted Canoe of Ely was born. For just over two months and almost 400 hours of work, I painted this aluminum canoe with the Boundary Waters Canoe Area Wilderness -past and present- to the best of my ability to make something unique to Ely that hopefully people would travel to see. It became my obsession, my Sistine Chapel. And while Michelangelo easily runs astronomically large circles around me artistically (it’s really close to zero comparison), he never painted a canoe. I told the hiker that this was the very first thing I ever painted in my life in which my end goal was not to sell it. 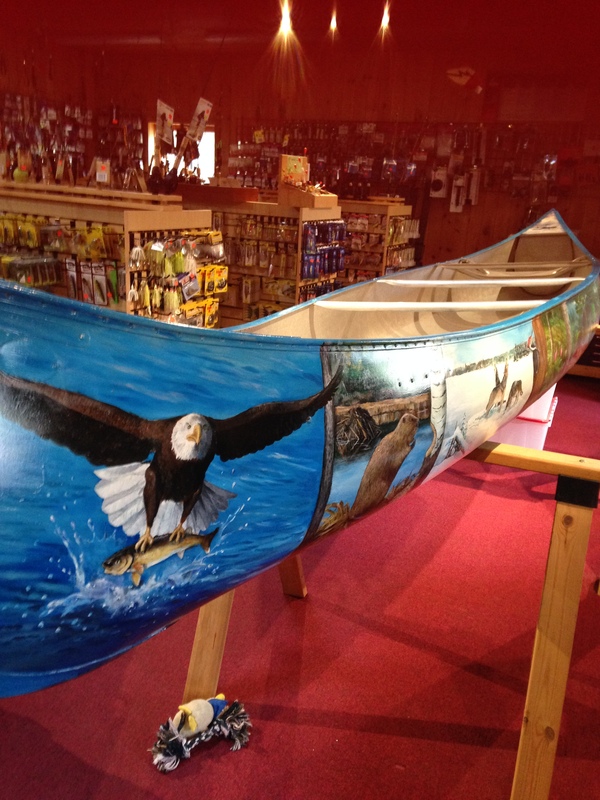 I’ve pretty much sold every piece that I ever painted, but this canoe was different for me. I was very happy that I was actually able to do this and am quite content with the outcome. He walked around the canoe, pausing and bending to examine the detail of the various scenes as they changed along the freeboard. He mentioned the 3D effect that some of the trees had along with the depth of the images. I attributed that particular effect to painting on aluminum. Painting on aluminum offers a visual presentation that stretched canvas won’t touch, I explained. I can’t quite figure out why, but it just does, and I really like it. He appeared to like it as well. He then asked if he could snap a few photos and wanted me to stand alongside the canoe for one of them. He said that he would never have guessed that walking for hundreds of miles and a chance following of a dirt road would lead him to see something like this work of art out in the woods. He seemed glad that destiny led him down this path and added that he was sure blessed to be walking across the country like this because this life experience was one that he couldn’t even imagine prior to actually doing it. I offered that one just doesn’t get to find the great things and people he’s found/met while traveling in a car. He agreed. With that, he shook my hand, looked one more time at the canoe and told me that I’ve “certainly made a lot of lemonade” and continued on his way. May his journey continue to be safe and worthwhile. It was an interesting mid-day for me. Own a piece of northern Minnesota with a fun gift basket from Ely, Minnesota! Get two beautiful and unique glass mugs hand painted by Ely artist Joe Baltich of Northwind Lodge, Red Rock Wilderness Store, and sole artist of Ely Art Company! Included are a 4-pot assortment of delicious Gene Hicks Coffee in a basket with pine cones picked right next to Jasper Creek at Northwind Lodge! You can’t get any more authentic than that! Makes a wonderful, thoughtful gift drenched in real wilderness from, you guessed it; real wilderness at Northwind Lodge on Jasper Lake! These will be available in limited numbers so order your Basket O’ Loon Mugs today while you can still get them. Cost is $69.95 with FREE SHIPPING! Applicable tax is extra.